The Literary Adventure was a rich experience. This is not a programme for beginners – as the value comes in having something substantial to benefit from the input, the discussions and the creative space. I was right to prepare as I had (see previous blog) because I was constantly able to apply the taught elements to my work. We opened in Malaga, in a perfectly adequate hotel. 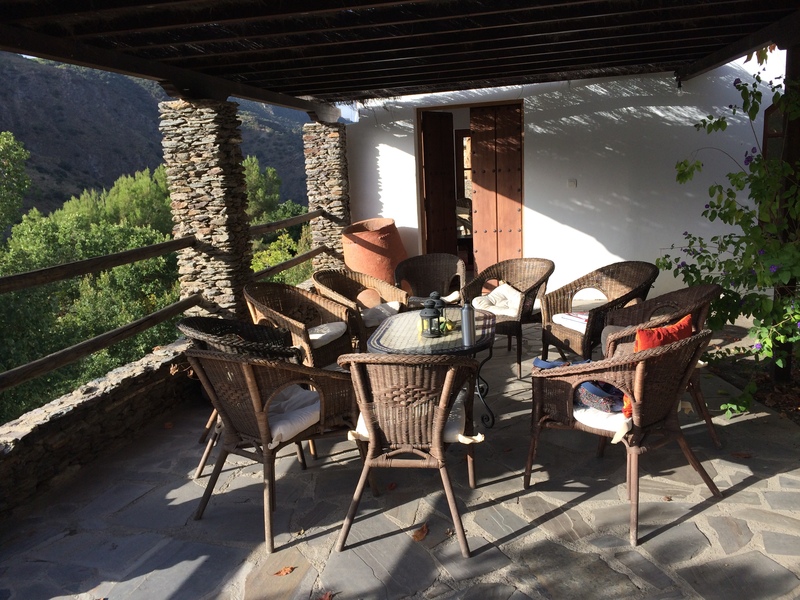 Most of the group met for supper before we transferred to Casa Ana in Alpujarra the following day, a Saturday. It had the feeling of a school outing, with everyone in high spirits and ready for the week ahead. It wasn’t until the Sunday (some two days after I’d arrived in Malaga) that we got down to the business of the creative writing tuition. Our tutor was Becky Abrams, a writer with an enviable CV and excellent teaching skills. Over the five mornings of the course she lead, demonstrated, shared, encouraged and delighted the group. The programme covered openings, description, narrative arcs, character (getting a three-dimensional feeling of character), narrative perspective, narrative voice, and finally, dialogue. We had writing exercises throughout, sharing and critiquing work, and a daily homework activity… as well as plenty of time and space to write for ourselves. In this way, the afternoons were somewhere towards a retreat; although I often chose to go walking. I couldn’t resist the mountains. Becky Swift, Director of TLC, sat in some sessions, and lead optional sessions in poetry, publishing industry and a Spanish film viewing. The compliment of the two facilitators, the two Beckys, was perfect. I’m not sure I could have asked any more of them. I was nervous before I went – after all, I’d never done anything like it, and I hadn’t been in a training group since my therapy training. All students/delegates/clients (?) are ‘vetted’ before hand via a telephone interview. This merely assesses the level of your writing experience, and I guess therefore, your potential fit into the group. I have to say, it was one of the nicest groups that I’ve been in a learning environment with – which can only serve to increase the learning potential. The course finished with one-to-one sessions with the two Beckys (individually), which were incredibly valuable to me. In thirty minutes Becky (A) has probably saved me thousands of words in draft that wouldn’t go anywhere. In looking at my synopsis, she spotted a major flaw in the narrative arc – the plot engine, to be precise. My take-away is worth the course fee alone. 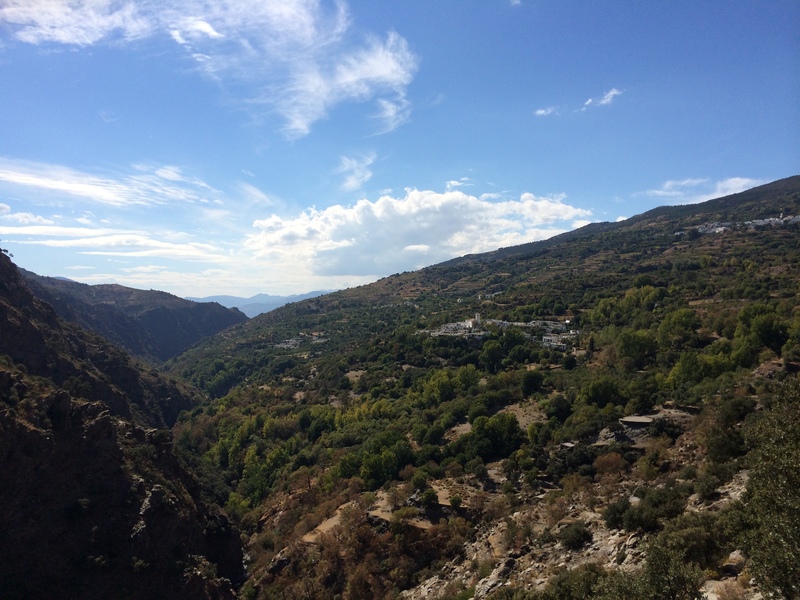 The village of Ferrirola, Alpujarra. 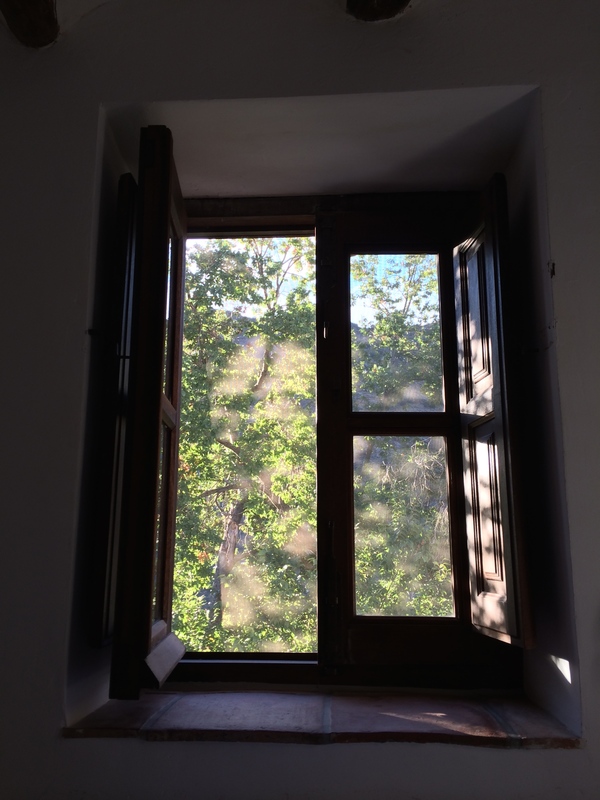 Casa Ana is in a small village, Ferrirola, perched on the sides of a deeply wooded gorge. It is remote; perfect for writers. The accommodation was quirky, and very comfortable with a mix of room types. I had my own room, but shared a bathroom (explained beforehand). It seemed to work for all of us. The food prepared at Casa Ana, by their chef Wes, was superb. We had breakfast and lunch there each day, with two evening meals – at the beginning and end of the programme. For the remainder, we ate out (at extra cost, clearly stated in advance), three a short walk (15 minutes) to the next village, and then the remaining night, an excursion to a nearby town – complete with market! Each meal was about 20€ a head, good value for quality food. Personally speaking, I enjoyed the local Spanish food over the more fussy fusion and the eastern-influenced vegetarian, but all were enjoyable. We wrapped up with a wonderful meal by the talented and creative Wes followed by an evening of performances. We all read something of our own work – not related to the course. It was a perfect ending, even though I was unsure of it earlier in the week. I’ve come away from the Literary Adventure more skilled, more confident, and more certain… with more writing friends and a network in TLC that I would trust with my writing life.